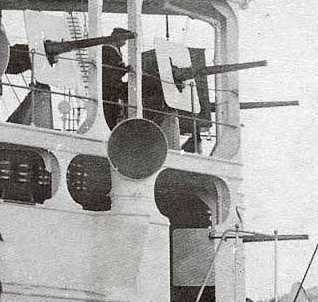 Single-barrel 47 mm guns on Retvisan. The Hotchkiss 47 mm/5 (5 = five-barrel) gun was first tested in Russia in 1879. Starting in 1884, the Russian Navy bought over 150 of these and the similar 37 mm five barrel gun for use as anti-torpedo boat weapons on large ships and to arm light craft. Russian production of these guns started in 1888 at Tula and by the time production stopped in 1896 an additional 40 weapons had been made. These Hotchkiss weapons were crank-operated, five-barrel revolver-style rotating guns, externally somewhat similar to a Gatling gun but having a different ammunition feed system. In addition to the five-barrel weapon, the single barrel 47 mm/1 (1 = single barrel) gun was also purchased. 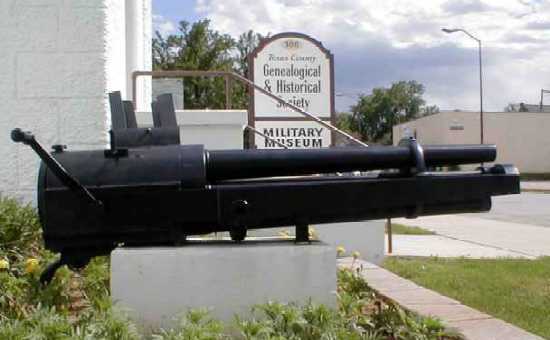 By 1901 about 693 guns of this type were in service. 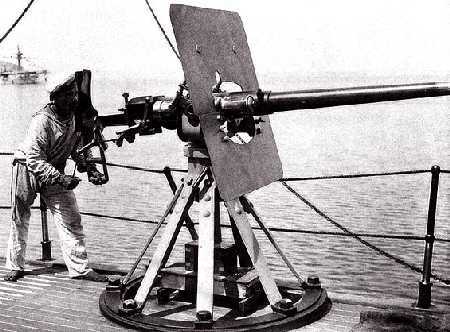 As these single barrel guns were easier to manufacture than the multi-barrel guns, they became standard equipment in the Russian Navy until 1905. In that year, combat during the Russo-Japanese War proved these weapons to be ineffective and they were quickly removed from most of the larger ships. During World War I and the Russian Civil War they were widely used to arm light ships and river craft. A number of them were converted into the AA guns and by 1917 at least 62 guns had been converted. Ten Japanese 47 mm guns were acquired in 1917 and used to arm the Ushakov destroyer class. These guns had monobloc barrels with a vertical blade type breech mechanism. ^As the feed lips on the rotary guns only held a few rounds and rounds were fed into them individually, it proved impossible for the loaders to keep up with the firing rate, hence the low practical rate of fire. 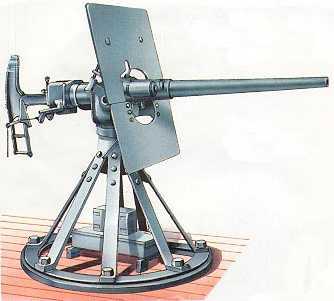 Single-barrel 47 mm Hotchkiss gun. 3-pdr. Hotchkiss Gun. Note the complicated shoulder yoke and that the sailor is in bare feet. Hotchkiss five-barrel 3-pdr now in Texas County, Missouri. Note the crank used to operate the weapon and the ammunition feed guides. Photograph copyrighted by Jim Price.